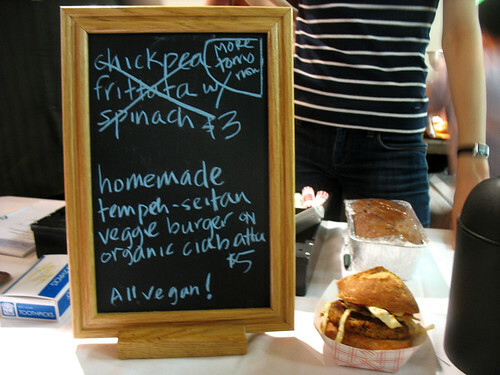 I was so excited to see a veggie burger for sale at the NYC Vegetarian Food Festival this year – last year I sampled a lot of delicious food, but I have to admit that I am biased and I was therefore disappointed that there were no veggie burgers amongst the options. So that’s another improvement in this year’s festival over last year’s! Even though we’d been stuffing our faces with free samples for the past hour, I was still hungry enough for a whole veggie burger, and this one looked delicious. The coleslaw was fresh and crunchy, and there was some kind of spicy sauce on it as well that gave the whole thing a nice kick. The patty itself (seitan and lentils) was tasty, and nice and crispy on the outside, but just fell apart too much. “My god, it’s everywhere!” Sasha exclaimed as she attempted to eat it. Luckily, I’d saved a fork from another vendor’s free samples earlier. The bun was a yummy ciabatta roll which tasted great but was a bit too chewy to eat a burger on (you know the type of bread I’m talking about – not the crispy, flakey kind, but the kind that’s so chewy you have to play tug of war with it in your teeth!). Nonetheless, I still enjoyed my burger and felt quite full afterwards. And like almost everything at the festival, it was happily clearly-marked as "all vegan!" on the sign at the booth. 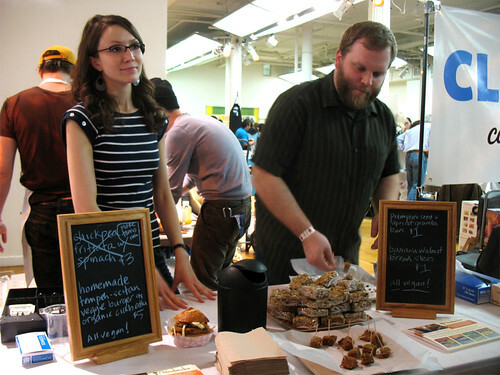 Read my full review of this year’s NYC Vegetarian Food Festival here. 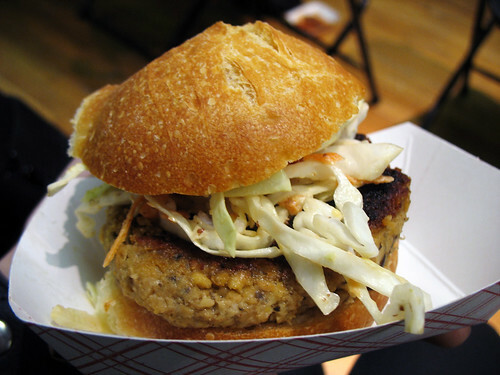 I was thinking about your blog last night as I ate my vegan Boca burger at the local bar - good to see you posting! 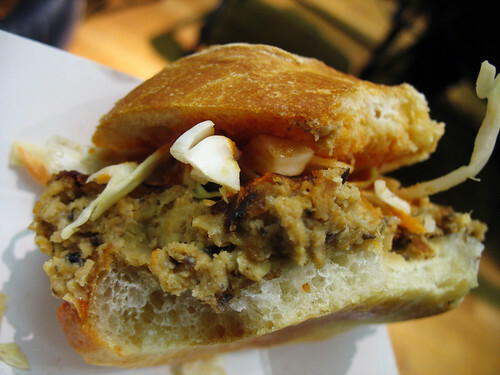 I'll have to check out the vegetarian festival when I'm back in NY.